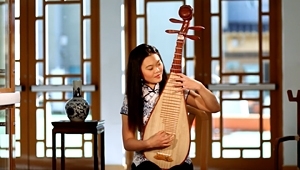 For thousands of years, the pipa, or Chinese lute, has reigned as the “king” of Chinese folk instruments. This plucked instrument is often found in the hands of heavenly maidens depicted in traditional paintings. The pipa’s construction further epitomizes ancient Chinese belief. Its body, by traditional Chinese measurement, is three feet five inches, representing the three powers—heaven, the earth, and man, and the five elements—metal, wood, water, fire, and earth. Meanwhile, the four strings represent the four seasons. 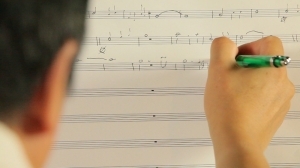 Its playing technique is quite difficult—it is plucked while held upright on the knee—and it is one of the most expressive Chinese instruments.